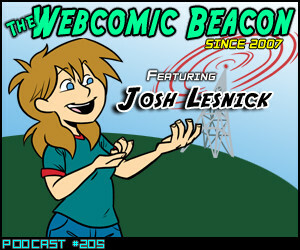 Josh Lesnick (Girly, Dr. Voluptua) returns to The Webcomic Beacon (after just 175 episodes), and joins Fes Works, Tanya Higgins, and Mark Savary this week! By the way, go buy the limited edition of the Complete Girly Collection, and maybe a figurine too! Maybe get a SlipShine Subscription? Music: Girly Girly Girly by The WHITE WIRES.